Some people worry when we use spray painting guns because they think that the paint particles might damage the cars that pass by in the street, just like the flowers and grass at the painter’s feet. But are they right to worry? Here are a few explanations to reassure you. The 3 types of paint sprayers First of all, it’s good to know that there are 3 kinds of spray painting guns, and each gun suits a certain type of painting because each has different characteristics. The spray painting gun for furniture gives very small droplets. The spray is small and not powerful at all. The airless spray painting gun, or airless paint sprayer, is the most often used. 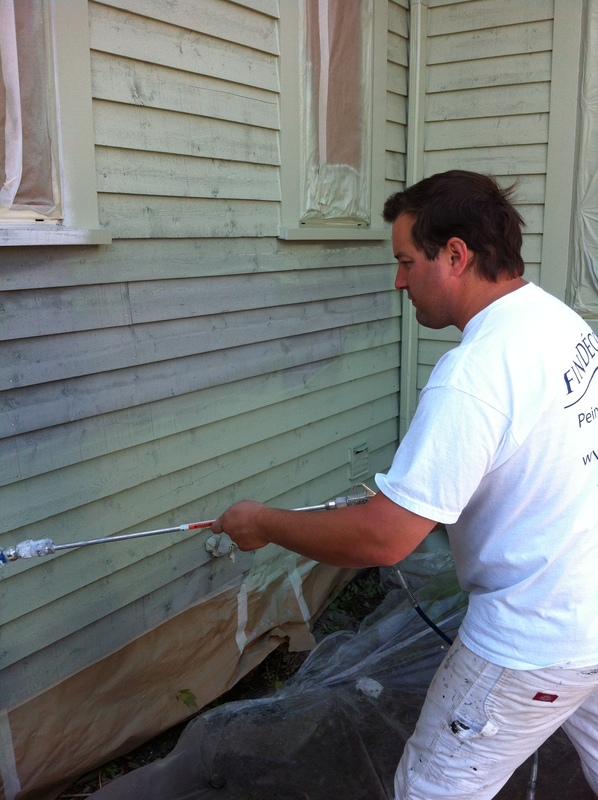 Excellent for painting cornices, the airless gun sprays paint drops with a high pressure. The pressure can be adjusted for different needs. Thus, we can choose to apply a high pressure (around 1000 PSI) to paint on metal, and a lower pressure on a wood surface so we don’t damage it. The large calibre spray gun is used to apply paint on large surfaces such as industrial buildings, and to apply epoxy (on concrete floor and others). It’s the most expensive spray gun, with the biggest spray, and the pressure is more powerful than with the airless spray gun. The professional building painters did receive proper training to manipulate the spray painting guns safely. When one is not careful, wind can throw the paint particles on the next door building surface. If the winds are violent, the paint might not have time to dry before it touches another surface and might stick to it. Professional painters know about the winds and acceptable distances at which it’s okay to paint. It’s important to always protect the grass or ground at the painter’s feet for at least two feet of distance from the wall. This way, no mess will be made on the grass, the parking or the floor, and the paint drops that fall on the ground will be easy to clean, no matter if they are dried or not. Indeed, the smaller the droplets are, the faster they will dry. Thus, there is no need to worry about the adjacent surfaces or the cars parked nearby. Obviously, we still recommend to move away the objects that can be easily moved, just in case the wind would come up. So are spray painting guns dangerous? In fact, the thrown particles are so small that they usually dry way before touching the ground. Plus, our painters did follow the necessary training to manipulate correctly those painting tools. So there’s no need to worry. To learn more about exterior painting, please refer to my post What is exterior painting?